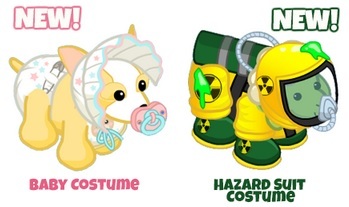 The Baby Costume and Hazard Suit Costume are the two new Halloween costumes available September 26th – November 21st – in the KinzStyle Outlet & Webkinz mobile app. Also, last year’s Banana Split and Toadstool Fairy costumes will be back for another year. 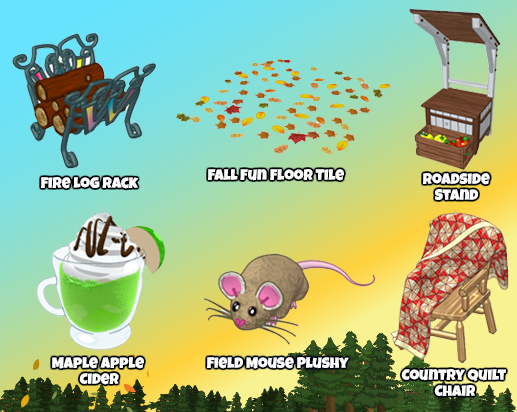 The Freaky Forest room theme will be back October 1st also but ONLY in the Mobile Zone section of the mobile W-Shop on the Webkinz app! The Halloween Challenge has great new prizes, so give yourself plenty of time to complete it! 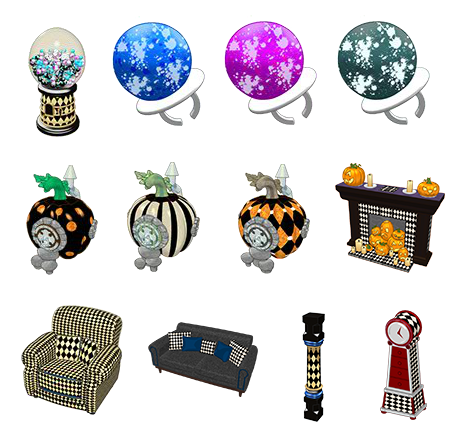 See below for the new Halloween Wall Hanging, Spooky Bunch of Balloons, Candy Bowl Fridge, & Spooky Ghost Plushy! 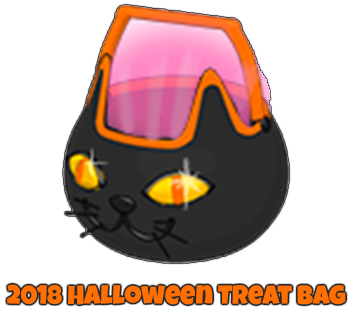 The floating Jack-O-Lantern from October 15th – 21st will award a Halloween costume piece (limited to 5 costume pieces a day, 8 for Deluxe players). There are a total of 80 pieces to collect of previously released costumes that you now have the chance to collect, in case you may have missed some in the past. Click here to view the full list and see pics of some of the costumes. From October 20th – 31st, collect candy from the ghost in the Reading Room to win a ghostly Grand Prize. We will also be able to spin the Halloween Super Wheel on October 31st. You can spin the wheel anytime from Today’s Activities on Halloween day (web only). This year they removed the KinzCash slots on the wheel so we are guaranteed to win a prize! October will be here before we know it, so don’t forget to enter the Webkinz community codes that expire on Sunday, September 30th. I love the new prizes!!! And I love new items for the haunted castle – the haunted castle torch is great!!! Glad they brought the haunted castle theme back. I wasn’t back to playing yet last halloween and i fell in love with the theme when i saw it. The baby costume is really cute! The hazmat one is nice as well, but I don’t like costumes that completely cover the pets. It’s about time they got rid of the kinzcash slots on the super wheel. I always got kinzcash which is really disappointing. 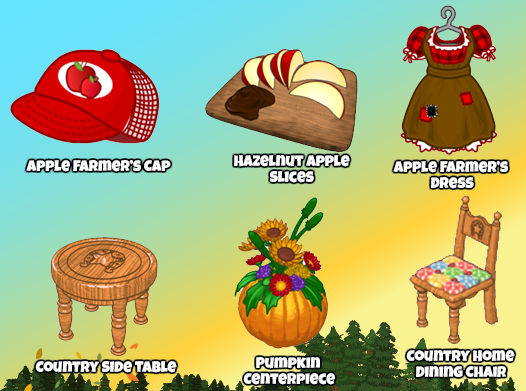 Aren’t they adding fall clothing to the kinzstyle outlet soon? Was there a date announced for it yet? I think it was the end of september but maybe I’m thinking of something else? Choco – the Fall Clothing Line is coming to the KinzStyle Outlet on September 26! I like the santakinz cottage one. Will the fall clothing line be there at midnight or sometime in the morning? I haven’t been able to log into webkinz either btw. although I did get a weird argument message on the app about floatys. I love the halloween treat bag this year, it’s a shame we don’t get to keep the bags as decorations. MY Fire Fox and Chrome are not letting me log in and MOBILE IS DEAD also . I have not been able to log in since 7:15 eastern time ! Hopefully the issues will be resolved in the morning. moms.. Hope your migraine is gone and you are feeling better this morning ! WW is still down this morning… Sure hope they are able to fix it today ! dee and Patsie… thanks for the new posts ! Choco. I keep one account just for the Holiday Bags… So many cute themes and they are too cute to open ! No sign of the Halloween goblins in the e store this morning… maybe they will be available later today ! anyone know how much them hobgoblin dudes are? dee—Hobgoblin They are 10,000 points (each) and 9,000 points (each) deluxe. They are too cute! Love all the stuff going on for Oct. The ghost balloons and plushy are awesome! gaga—I keep an acct. for special bags and boxes too! I would love if they made it so when you open the bag you got a copy of the bag to put in your room. Diesel is doing okay so far…keeping fingers crossed! The new Christmas themes all look fun, wish we could see a few more sketches of each. Afternooooooon Gymbonians, and a verrrrrry verrrrrry scarrrrrrry HALLOWEEN UPDATE WEDNESDAY toooooo yoooooooou. Booooooooo! So let’s jump right in with PETS! 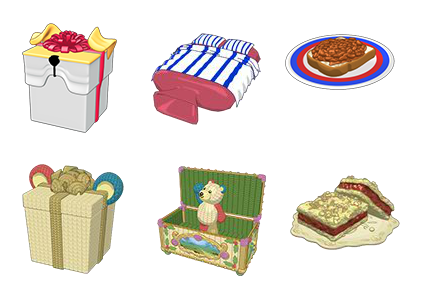 Top row: British Bulldog Gift Box, Hot Water Bottle Bed, Beans on Toast. Bottom row: Be Merry Bear Gift Box, Vintage Music Box (NEEEEEEED! ), Honey Date Bars. The Be Merry Bear is most likely a Christmas pet, and I MUST. BUY. IT. so I can add that music box to my collection! More pets! Top row: Fox Kit Gift Box, Sly Reading Nook, Wild Game Benedict. Bottom row: Holiday Kitten Gift Box, Soft Sparkle Wardrobe, Purrfect Pizza. Moms already uploaded the photo of the Fox Kit, which SQUEE! More pets, and YAY! Goblins! 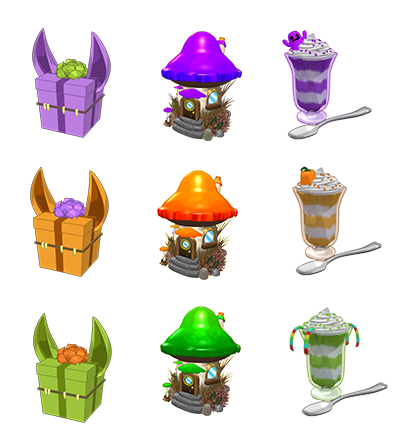 Top row: Lil Purple Goblin Gift Box, Purple Mushroom Cottage, Purple Petrifying Parfait. Middle row: Lil Orange Goblin Gift Box, Orange Mushroom Cottage, Orange Petrifying Parfait. Bottom row: Lil Green Goblin Gift Box, Green Mushroom Cottage, Green Petrifying Parfait. Hurray! My Gringotts Bank on my Harry Potter account will finally have goblin bankers! 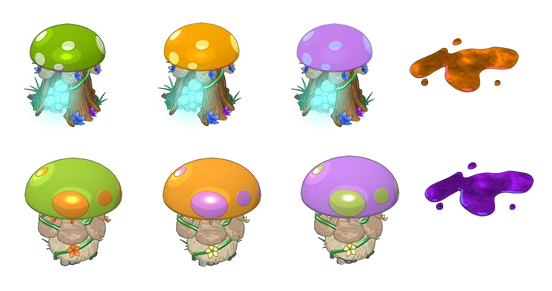 The Mushroom Cottages are recolored versions of the Short Mushroom Cottage from last summer’s mystery bags. Lazy! And that’s not all! If you buy a Lil Goblin within the next ten minutes, we’ll include all this stuff for free! (I don’t actually know how this stuff will be released yet, but I wanted to include that line! ) Top row: Purple Goblin Plushy (SQUEE! ), Orange Goblin Plushy (SQUEE! X 2), Green Goblin Plushy (SQUEE! X 3). 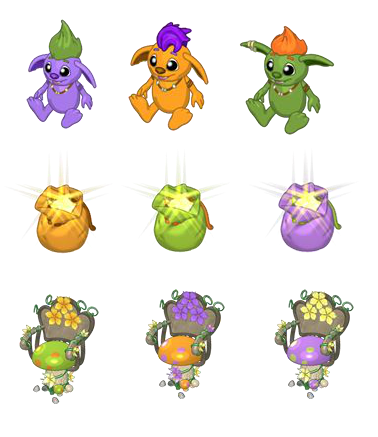 Middle row: Orange Goblin Pouch, Green Goblin Pouch, Purple Goblin Pouch. Bottom row: Green Mushroom Chair, Orange Mushroom Chair, Purple Mushroom Chair. The pouch is a recolored version of the Jake Saves Bucky promotion Pixie Dust Pouch. Lazy x 2! And the Mushroom Chairs are recolored versions of the Enchanted Toadstool Chair from the estore. Lazy x 3! More goblin-related stuff! Top row: Green Mushroom Lamp, Orange Mushroom Lamp, Purple Mushroom Lamp, Orange Ooze Carpet. 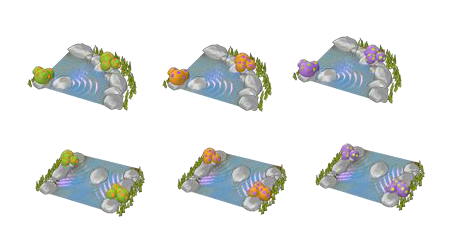 Bottom row: Green Mushroom Trampoline, Orange Mushroom Trampoline, Purple Mushroom Trampoline, Purple Ooze Carpet. 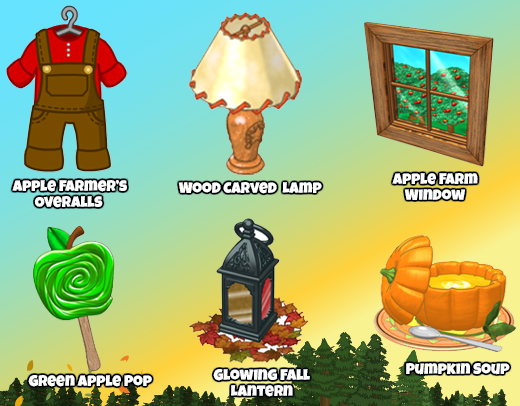 The mushroom lamps and trampolines are recolored items from the Toadstool theme in the WShop. Lazy x 4 and 5! And the ooze carpets are recolored items from the Haunted Halloween theme. Lazy x 6! But wait! There’s more! Top row: Curved Green Creek Tile, Curved Orange Creek Tile, Curved Purple Creek Tile. Bottom row: Straight Green Creek Tile, Straight Orange Creek Tile, Straight Purple Creek Tile. The creek tiles are recolored Freaky Forest creek tiles. Lazy x 7 and 8! While we’re on the subject of Halloween, let’s continue in that vein! Top row: Dark Forest Wallpaper, Dark Forest Flooring, Jack O’Lantern Sleeper, Jack O’Lantern Chair. Bottom row: Pointy Hat Cottage, Spooky Windmill, Gummy Ghost Tree, Gummy Ghosts. The Dark Forest walls and floors are the next Room with a View theme. 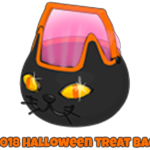 The Jack O’Lantern items coordinate with the other Jack O’Lantern items from the estore. 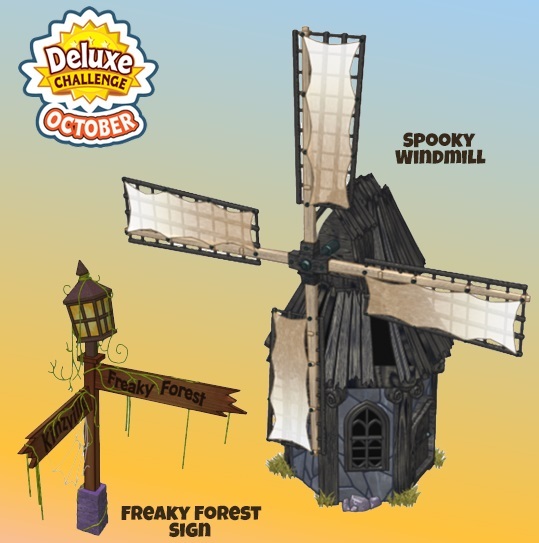 The Spooky Windmill is the prize for October’s Deluxe Challenge. And the Gummy Ghost Tree is October’s candy tree. More Halloween! Top row: Halloween Wall Hanging, Spooky Bunch of Balloons, Candy Bowl Fridge, Spooky Ghost Plush (SQUEE!). 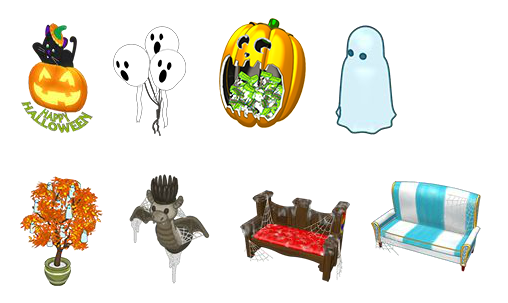 Bottom row: Ghostly Potted Maple, Haunted Castle Torch, Haunted Castle Bench, Haunted Hotel Couch. The top row plus the potted maple are all prizes from the 2018 Halloween Challenge. The haunted castle stuff will probably be added to the haunted castle WShop theme. The Haunted Hotel Couch is probably estore. Argh, my last post got eaten! Please, somebody fetch it from the spam bin! More Halloween! Top row: Eerie Woods ?? Box, Eerie Woods Wallpaper, Eerie Woods, Flooring, Eerie Woods Mansion. 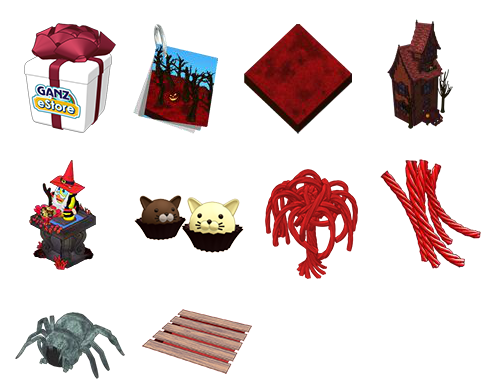 Middle row: Eerie Truffle Dispenser, Black Cat Truffle, Eerie Licorice Tree, Red Licorice. Bottom row: Eerie Woods Cave, Eerie Woods Storage. This is the next ?? Box theme. Not sure if the dispensers will be in the box, or if they will be points promo items. And yet more halloween! Top row: Spooky Gothic Dispenser, Blue Jawbreaker Pop, Pink Jawbreaker Pop, Black and White Jawbreaker Pop. Middle row: Polka Dot Pumpkin Cottage, Striped Pumpkin Cottage, Harlequin Pumpkin Cottage, Spooky Gothic Fireplace. 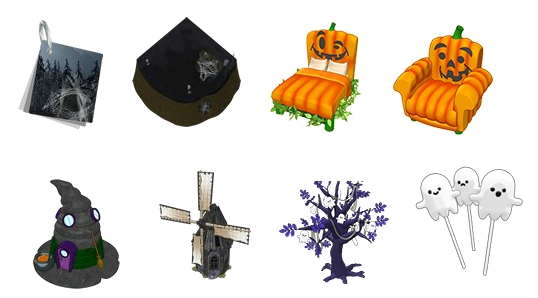 Bottom row: Spooky Gothic Armchair, Spooky Gothic Sofa, Spooky Gothic Column, Spooky Gothic Clock Storage. This is all estore stuff for the Spooky Gothic Theme. Let’s move on to clothing! 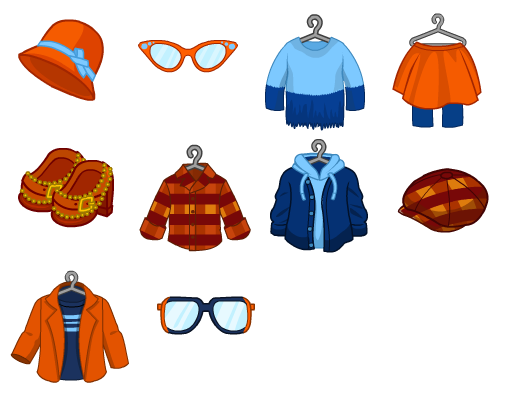 Top row: Orange Cloche, Butterfly Glasses, Fringed Sweater, Orange Velvet Skirt. Middle row: Buckled Heels, Autumn Sunset Coat, Layered Hoodie, Orange Newsboy Hat. Bottom row: Autumn Jacket, Navy Frames. These are the fall KinzStyle Outlet clothes. More clothes. Top row: Hazard Suit Costume, Hazard Suit Mask, Hazard Suit Shoes, Ghostly Glasses. Bottom row: Baby Diaper, Baby Bib, Baby Bonnet, Baby Soother. The hazard suit and baby clothes are obviously this year’s Halloween costumes, since that’s the subject of this post! Not sure how the Ghostly Glasses will be released. 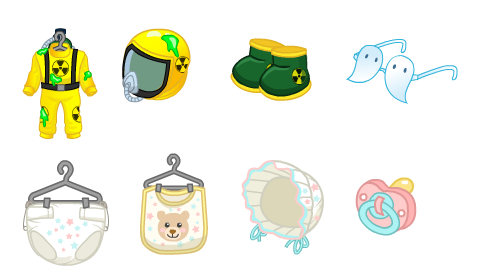 For the curious, the baby costume is the Trendy Baby Costume from the mystery bags recolored. Lazy x whatever number we’re up to now! Yet more clothing, and I have a feeling this is Christmas Cracker! YAY! Top row: Evergreen Queen Crown, Evergreen Queen Gown, Evergreen Queen Slippers, Holiday Sweater Dress. 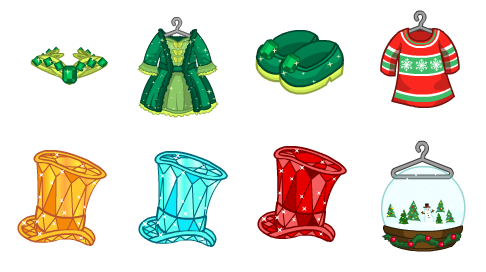 Bottom row: Topaz Top Hat, Zircon Top Hat, Garnet Top Hat, Snow Globe Gown. We will finally finish the gem top hat collection. And I’m calling it now: I bet the snow globe gown is animated, and I bet people will be trading their first-born children in the trading rooms for it! And finally, the last of the clothes and some random newness. I think the two clothing items might be part of the fall line, but I can’t be sure, since they were stuck so far away from the rest of the line in the system. Top row: Autumn Pants, Orange Hiking Boots, Rose Zircon Mosaic Tile, October WKN Gift Box. 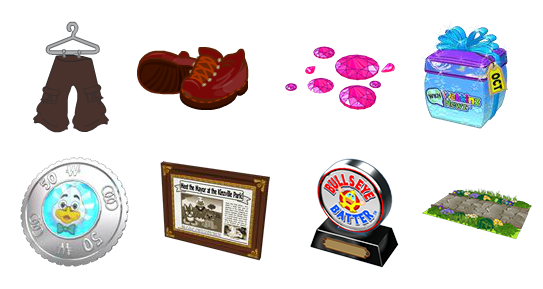 Bottom row: Mayor Quack KinzCash Coin, Mayor Quack Newspaper Clipping, Wacky’s Bullseye Batter Trophy (UGH! ), Countryside Cottage Garden Path Clubhouse. The zircon tile (which I was hoping was going to be opal, argh!) is in the October WKN Gift Box, along with the Mod Raspberry Lounger I showed you last time. I think the Dr. Quack stuff is because he is retiring as mayor, which means we have an election coming up in WW. Obviously, the next trophy challenge is Wacky’s Bullseye Batter, which UGH. And the Clubhouse designation on any image means that theme will be in the Clubhouse, so look for the Countryside Cottage theme to be in the clubhouse soon, or for that path to be used in a clubhouse room. Mayor Dr. Quack does NOT have a post this week (?! ), so that is all the information I could ferret out this month. Until next time, this is TheSpoilerLurker signing off. This post will self-destruct in 5…4…3…2…1…BOOM! boper – looks like i got home at just the right time – thank YOU to you & to TSL for the hard work today!!! i’m dead – i can’t look at anything else – how would anyone choose ONE of the goblins?! this is so wrong, i don’t wanna be right … it’s cuteness overload and they need the perfect names! what were shreks kids names? gah a whole bunch more plush toys to collect! I don’t know if it was shown on here before, but there’s the new wacky student plush too. I’d dress them as witches and name them after the Sanderson sisters from Hocus Pocus. Winifred, Sarah and Mary. choco – what a cute idea! made bagels? people actually make their own bagels? Soooooo, got back from ER, DS fractured his elbow. Have appointment with orthopedic surgeon on Friday.requesting prayers for quick healing and no surgery . awwww gwenda – so sorry to see that! praying for all good news! Gwenda – Awww… I’m so sorry to hear about your son’s fractured elbow. I hope it heals soon! These goblin pets are friggin adorable! I can’t afford to pay my medical bills. I will need to find a job within the next few months just to make ends meet, but the level of cuteness in these goblins! OMG… the highly stressful financial dilemmas of the 21st century white woman. And then once you buy them, you must decide what to name them…. c’mon! I can’t handle this level of stress! Gwenda… sorry to hear about your son’s injury… Good luck with orthopedist on Friday and hopefully will heal without surgery ! April… happy to hear D is doing better !! Lurker.. Thanks for all of the updates !! 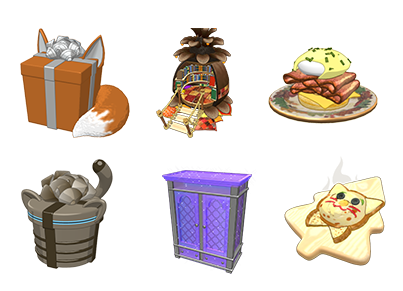 One of my favorites things … reading and looking at all of the upcoming items… Thanks for always keeping us posted! Boper thanks to you too….for giving the updates an image !! Hope school is going well ! Love the new plushies !! Getting close to “Recess” at the Academy and hope to win the new plushy doing the digging in the sandbox ! Dee – Thanks for the link for all the pumpkin recipes! Moms – I used my instant pot twice last week for beans and I love it for that! I haven’t ventured out yet into other recipes, but I have several friends that are sold on the instant pot. I am going at a slow pace with it. We will see if it is worth it for me. Oh….I have never heard of an air fryer. Sounds interesting! Gwenda – Sorry about your son. Not fun! TSL – Thanks for all the pics! I love looking at all the items! Appreciate all your effort putting it together! Love the little goblins and I think I have names for them. Just not sure that I will buy them. It would be easier if I didn’t have names because I don’t usually buy pets unless I have a name. Sigh! The dilemma is always $$$. 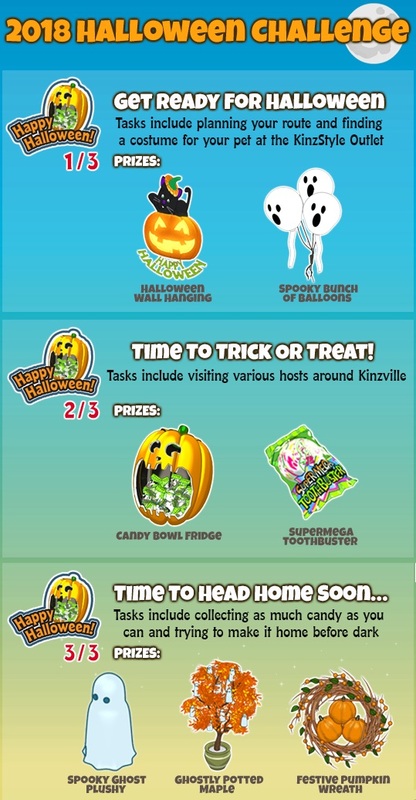 Love the ghost plushy item, but not particularly crazy about the candy bowl fridge. I think the baby costume is cute! 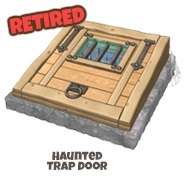 I like the new haunted theme items! Exception – I did buy the ostrich plush and I still don’t have a name for it! I saw someone on another blog named their Goblins Bingo, Bango, and Bongo! All we need is Irving! we do do one with kraut……..a good crockpot one with pork chops is kraut, taters, carrots and granny smith apples! and since wife of the year awards are coming up, i made jalapeno cornbread too! and homemade bagels are easy if you bake at all and are semi patient! and they be sooo stinking good…………dh put poppy seeds and cheddar cheese in “his” and i toasted sesame seeds with garlic, salt, minced onion for “mine”. those are good names puma……..
i have my eye on a green one……….when can regular folk buy them? moms, thanks for the heads up on the floating leaves! I love this year’s prizes, especially the new seeds. And your cooking show set looks really cute! Congratulations on your trophy win, bepsy! april, I hope Diesel’s feeling better. And thank you so much for the goodies! I’m looking forward to all of next month’s events. Lots of cool new prizes! Gwenda, I’m sorry to hear about your son’s injury. I hope he recovers quickly. TSL, thank you so much for the spoilers! Oh my gosh, the Purple, Orange and Green Goblin Plushies are the cutest things I love the Eerie Truffle and Licorice Tree dispensers as well. And the Snow Globe Gown’s adorable! Just a heads up, if you have any Mayor Dr. Quack Gift Boxes in your dock, they’re now awarding the new Mayor Quack KinzCash Coin and Newspaper Clipping (among previously released prizes) that TSL showed in comment 25. Has any one tried Tile Towers in mobile app? It doesn’t seem to be recording KC for me. Sometimes I get booted out. Just wondering if I’m the only one with the problem. Finally Friday !! So Happy !! I am loving the names that you all are coming up with for the new goblins ! Queen of Sheba… I name my ostrich Phyllis Dilley… thought it looked like her ! Cheese.. 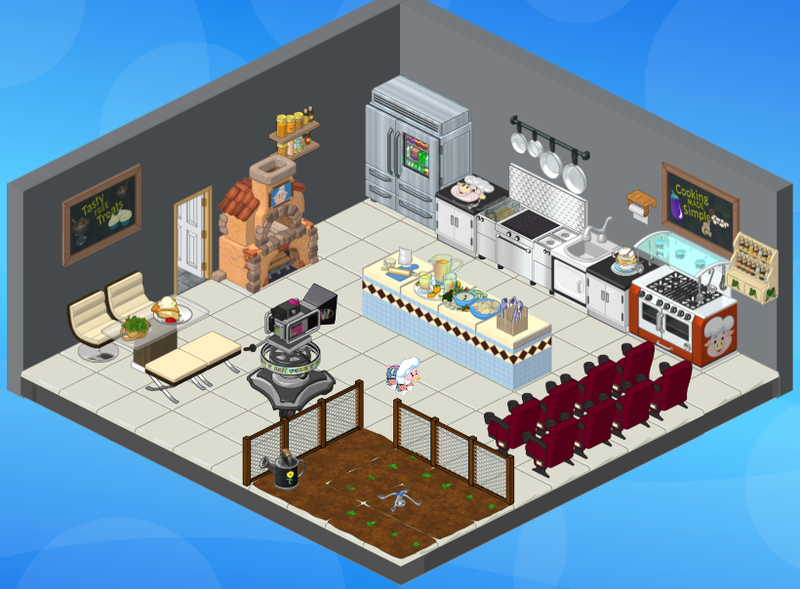 Thanks for the tip about Dr Quack boxes… was able to get the new prizes ! Can’t believe October is right around the corner !! Time sure does fly !! New month always brings new WW challenges..prizes and some fun activities..
Phyllis Dilley works, Gaga! I will probably name her/him something else, though. Waiting for inspiration. I have other pets in the line up before the ostrich! Not that THAT matters! Once a name is “born”, adoption is more likely! Hey, I wrote to Webkinz last night on FB about Tower Tile problem on app. They wrote back saying that they are looking into the problem. It seems like I wasn’t the only one! I have family coming in tonight! Going to a baby shower in the morning with my daughters (out-of-town). Later in the day (tomorrow) I will most likely play Webkinz with my step-granddaughter! She loves going to recess at the Kinzville Academy, but hardly ever gets computer time at home. SO, I “pet sit” her account and she is ready to go to recess! De-cluttering project going on in RL. Son throwing things away and I’m taking some of it out of the trash! Sigh! It would be better if he took it to his place and disposed of it! LOL! So many memories & so much junk, not necessarily attached to one another, thank goodness! Otherwise, it would not look like progress was being made. Queen of Sheba- I’m not sure about kinzcash, but I kept getting kicked off as well. Usually after 1-2 games, which was annoying because I was using the game to kill time between leaves. Lots and lots and lots of homework/studying to do this weekend. I told myself I was gonna do it when I got back from class, but instead I’m going to the mall with my mom. Very responsible. Thank you Cheese for the surprise gifts in the past few days. Yay creek pieces! I’ve been trying different configurations for the perfect creek. Maybe through an orchard, since I have apple trees coming out of my ears! And thank you to anyone I’m forgetting for gifts! It’s always exciting to get mail! The toddler is so desperate to SEND mail, we might just begin sending “love letters” to y’all- if you get one from PumaPardus, know it comes with extra love from Toddler! He picks all the paper and stickers! got to skype with the kiddo last nite……..pretty cool………..she looks just like her dad except she has my nose thankfully………but wow! big blue eyes, real long eyelashes, dimples………..and the color hair he had when we first met……..he says i made him grey……..oh well….at least he has survived! choco, you are just prepping yourself! and sheba, what about Kojak? he was a baldy……. and i am the one here who so ready to throw out the construction paper chain and milk carton haunted house that were made in kindergarten! so ready to get rid of stuff, but if i mention it, everyone suddenly LOVES it! really? after they been female dogging about it for years? and i just ginned up a cuke salad which will go lovely with the pork and mac n cheese…………dh is off to man type flea markets tomorrow, so i get the house to myself……..so i will do floors and mac n cheese and maybe a cake or something………..
as i go thru dds room, the small treasures i put in mason jars………..something about girls and miniature stuff………she thought it was a great idea and NO DUST!